The daughter of a resident in a Winnipeg long-term care home that was the site of a deadly salmonella outbreak last month says she was never informed about what happened. Holly Doan’s 93-year-old mother lives at Golden West Centennial Lodge in Winnipeg. Earlier this week, the 116 bed facility confirmed two people died after a salmonella outbreak last month, after an internal email about the deaths was leaked to CBC News. Doan, who is the primary contact for her mother, said she was never informed about the outbreak, even weeks after it was confirmed. “I learned about it like anybody else— in the media,” Doan said. “They should call me if people are passing away because of a salmonella outbreak, and especially when they don’t know what the cause of it is,” she said. Earlier this week, the facility’s director said all family members had been contacted. Doan’s mother has advanced dementia, is confined to a wheelchair, and can’t speak. Doan lives in Ottawa, but said she regularly receives communication when her mother falls, becomes ill, or needs a medication change. The outbreak was officially confirmed March 20. In the weeks following the outbreak, Doan said family members who regularly visit her mother were never told about what was going on. She was shocked to learn about the salmonella outbreak in the news. “I understand it’s mysterious. It’s troublesome. But that’s all the more reason to call people and reassure them that you don’t know what you’re on it,” she said. Right now, health officials will not release information about the two people who died, including their ages or when they died, citing privacy of patients. Doan said she deserves to know more about what happened. “Did the individuals who passed away live on my mother’s floor? We don’t know. Has my mother exhibited symptoms? We don’t know. Has my mother been tested? We don’t know,” she said. Doan said Golden West had been very good at communicating with her in the past. She said she emailed the home on Saturday asking for more information about why her family wasn’t informed about what happened. Health officials are currently investigating an outbreak of salmonella in six provinces across the country, including Manitoba. The Public Health Agency of Canada said 63 people have become sick, but the source of the bacterial infection has not been identified. On Friday, the Winnipeg Regional Health Authority said two people had died after testing positive for salmonella, but health officials said it has not been confirmed whether the bacterial infection contributed to the deaths. Salmonella is a common bacteria that causes sickness, with symptoms that include nausea, vomiting, fever, abdominal cramps, diarrhea, and chills. 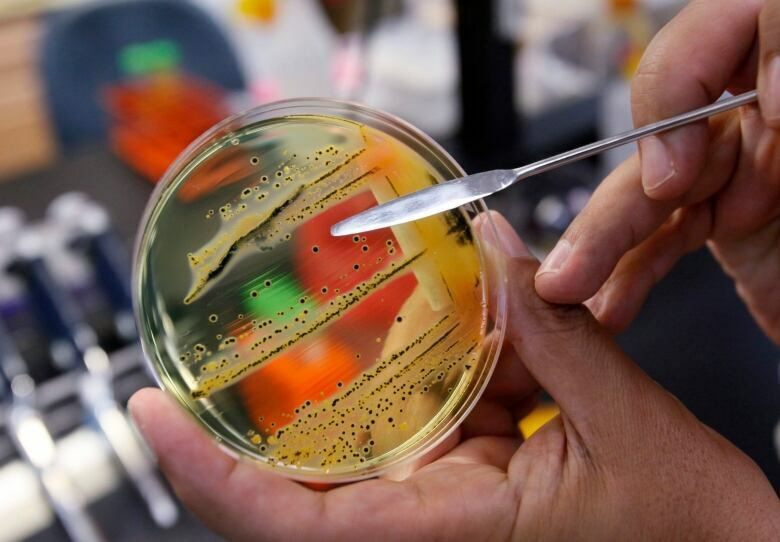 The bacterial infection can be spread by eating or drinking food or beverages contaminated with salmonella, by contact with other infected people, or contaminated surfaces.